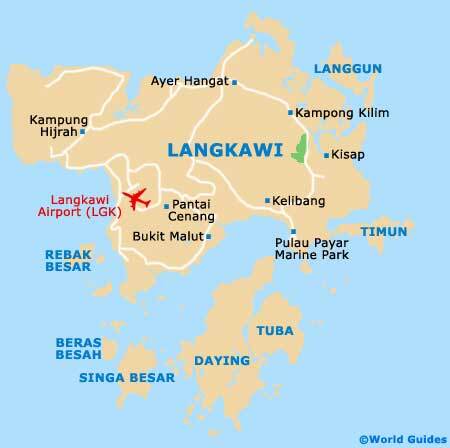 There is a diverse collection of sights and landmarks on Langkawi and its associated islands. They range from high mountains and caves to lakes and ancient villages, and most of the sights are within reach of resorts and beaches. The lofty Mat Chinchang mountain is the island's top landmark and can be climbed up or visited by cable car. There are also many interesting caves that are accessible by boat, while the Kedah Traditional House and the Field of Burnt Rice at the town of Padang Matsirat display the Langkawi of yesteryear. Mat Chinchang mountain is the highest point on Langkawi, at 881 metres / 2,890 feet high. It is served by cable cars from the Oriental Village and has a large walkway atop it, where you can soak up splendid views of the island. On a fine day, when there is no fog, it is even possible to see as far as Thailand. You can also hike up the mountain and take in the Seven Wells Waterfall (Telaga Tujuh Waterfall) on the way up. A hotel restaurant provides food and drink up top. Langkawi is home to many caves, both inland and near the shore. Gua Cerita is the most impressive and is near to Tanjung Rhu, being reached by boat. Literally translated, Gue Cerita means the 'Cave of Legends' and features a couple of large chambers and fine views over the sea. There are various myths and legends associated with the cave, which you can learn about with a guide. Close by, if you take a stroll along the beachfront you will likely find fish mats drying out freshly caught anchovies in the sunshine. This beautiful lake is situated on Dayang Island (Pulau Dayang), within the Bunting Forest Reserve. Aside from the legend of lending fertility to infertile women, this attractive freshwater lake is also a good swimming spot away from the beaches. This protected area is accessible by boat from Langkawi, plus you can also explore the lake itself by renting a pedalo boat. If you sit on the edge of the lake and dip your toes in the water, you may well find them being nibbled by one of the many catfish living here, or possibly the legendary white crocodile who is believed to live here as well. Nearby is the Cave of the Banshee (Gua Langsir), where literally thousands of bats live. A must for folk wanting to learn about traditional Langkawi is the Kedah Traditional House. This all-wooden abode is located in the inner village of Mawat and faithfully recreates a taster of the island's past. It features wood carvings of period furnishings, with the authentic reproduction of a traditional kitchen being particularly impressive and realistic. Located in Kampong Mawat, approximately 17 km / 11 miles to the north-west of Kuah, the Kota Mahsuri is a historical landmark comprising a number of different attractions, such as a visitors centre with various dioramas, and a white-marble shrine to Princess Mahsuri, the final resting place of the fair maiden Mahsuri, who was executed in 1819 after being falsely accused of committing adultery. There is also evening entertainment in the form of dinner and theatre. Located close to Mahsuri's Mausoleum, the Field of Burnt Rice is a popular historic site on the island. The Siamese destroyed the rice granary here in the 1800s, although the villagers actually burnt the fields of rice themselves, to prevent them being used by the invaders. You can still see remains of the original village, which once served as the islands' ancient capital, and locals say that during the heavy monsoon rain, burnt rice grains are occasionally washed to the surface. Nearby are the west coast beaches, while the airport is also in this direction.